Topics: [contact Us], [locks], [safes], [hardware], and [door Closers]. Age: It went live on February 18th 1999, making it over 19 years, 1 months old. 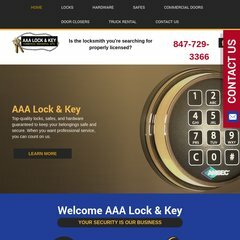 There are 1 Nameservers, ns.aaalock.com. It is hosted by American Registry For Internet Numbers (Virginia, Chantilly,) using Apache web server. Its IP Number is 69.72.133.130. PING (69.72.133.130) 56(84) bytes of data. A time of 29.0 ms, is recorded in a ping test.